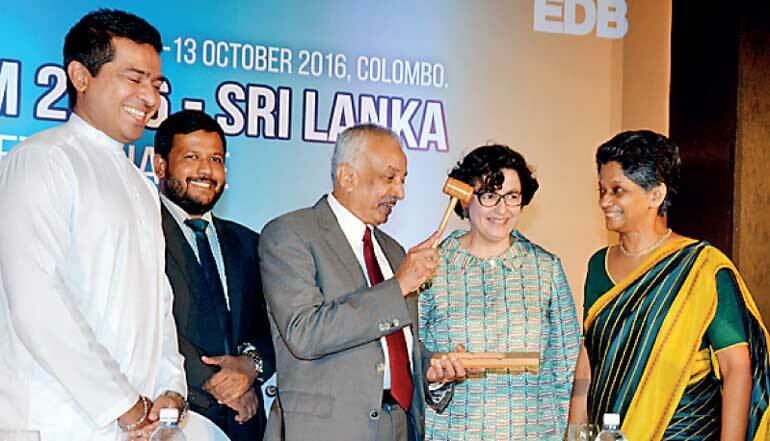 The World Export Development Forum (WEDF), the flagship event of the Geneva-based International Trade Centre (ITC) will be held in Colombo, on 12-13 October 2016. Over 300 foreign delegates are expected along with an equal number of local participants. WEDF will bring together more than 600 policymakers. business leaders, and officials from trade and investment support institutions (TISI) and international organizations to discuss how to achieve sustainable and inclusive economic growth through trade. A series of business-to-business matchmaking events will also be held over the two-day meeting, allowing participants to create business linkages across sectors and across countries. “Our way forward in exports is to go beyond the primary and traditional export basket to higher value innovative and original products and services,” EDB Chief Malwatte said. “EDB interaction with international business partners is crucial at this stage. WEDF B2B sessions are focusing towards achieving these national economic objectives through creating opportunities for entrepreneurs to actively participate in the global supply chain by identifying the competitive roles that we can play,” she added. The theme of WEDF 2016, ‘Trade for Success: Connect. Compete, Change’, reflects the importance ITC and the Government of Sri Lanka attach to the role of enterprises in trade and job creation in Sri Lanka and elsewhere, SMEs form the backbone of the economy, representing over 90% of all business and contributing to two-thirds of global employment. WEDF 2016 will focus on hot-button issues shaping business competitiveness, from emerging mega regional trade agreements such as the Regional Comprehensive Economic Partnership and the Trans Pacific Partnership to the opportunities and risks presented by the rise of the digital economy. Participants will also confront the issue of standards, another crucial element for entering new markets and achieving trade success. In the build-up to WEDF 2016, Ms. Gonzalez and Minister Samarawickrama also announced a series of training programs for Sri Lankan growers/producers and exporters on safety and quality standards as well as for young entrepreneurs through ITC’s SME Trade Academy platform. During WEDF 2016 a series of ‘In Focus’ sessions will be held to explore how young entrepreneurs can take their ideas to markets, how to help connect women entrepreneurs to markets. improving managing logistics in the supply chain, and how to go digital. ITC has a Iong lasting partnership with Sri Lanka. It has supported the development of the private sector in areas such as export strategies, strengthening of trade and investment support institutions, market analysis and research, south-south trade promotion and non-tariff barriers. Starting mid-2016, ITC will step up its work on trade policy, trade facilitation, and quality and value chain development to increase the competitiveness of Sri Lankan SMEs, including targeted support to women business owners in Sri Lanka.